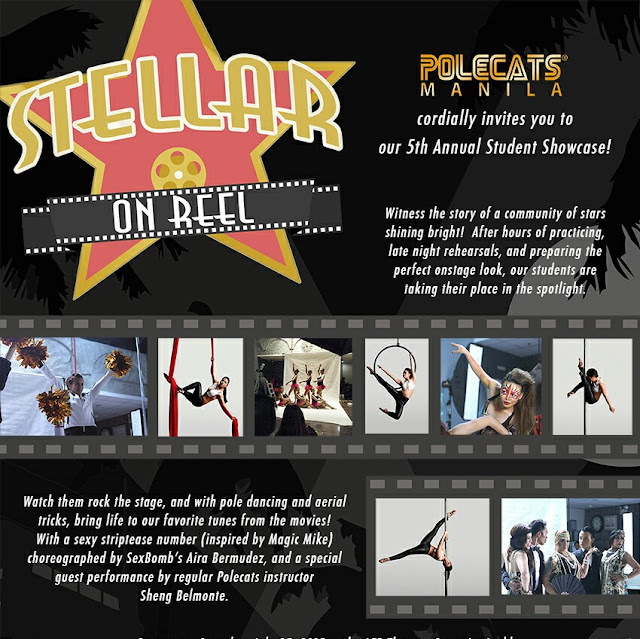 Polecats Manila, the country’s premiere aerial arts school, is showcasing their student athletes this July 25, 2015 in a recital entitled “STELLAR ON REEL.” The show is the 5th annual student show from the school, and will feature almost 100 aerial enthusiasts in pole dance, aerial silks, aerial hoop and dance numbers inspired by popular movie soundtracks. Movies like The Hunger Games, Mission: Impossible, Charlie’s Angels, and Bring It On will be interpreted onstage showcasing the students’ aerial expertise. A big Magic Mike-inspired number choreographed by SexBomb’s Aira Bermudez will also feature student members from the Polecats Manila studio in Ortigas Center, and new students from the Alabang class they opened earlier this year in 360 Fitness Plus, Westgate Center. STELLAR ON REEL is on July 25, 2015 at 7pm in AFP Theater, Camp Aguinaldo. Tickets are at P500 and are available through any student or teacher, or at the Polecats Manila studio, 22nd floor, Strata 100, F. Ortigas (formerly Emerald) Avenue, Ortigas Center, Pasig City. 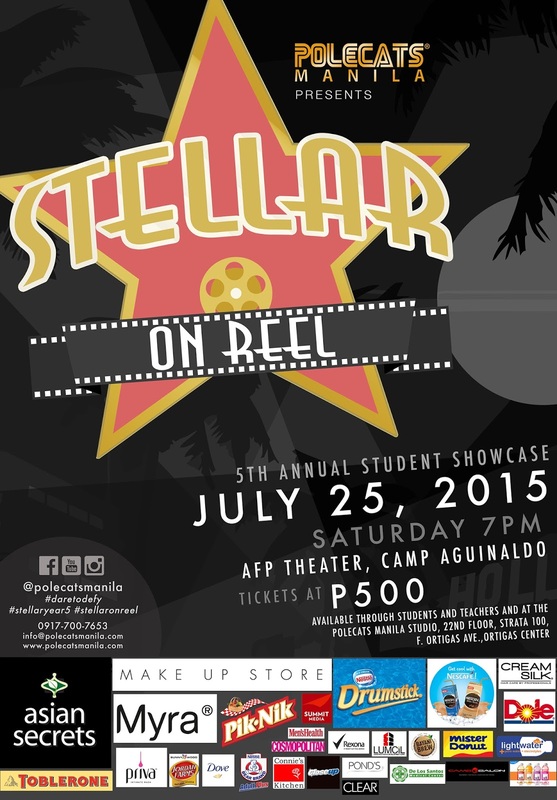 STELLAR ON REEL is made possible by copresentor Asian Secrets Green Tea Scrub and major sponsors, the Make Up Store, Nestle Drumstick, Nescafe Smoov Latte and Myra capsules. Official partners are Summit Media, Priva Intimate Wash, Toblerone, Piknik and Cream Silk. Event partners are Dole, Bear Brand Adult Plus, Lightwater, Vitamin Water, Dove, Closeup, Pond’s, Mister Donut, Connie’s Kitchen, De Los Santos Medical Hospital, Lumicil, Cams Salon, Rexona, Bayani Brew, Clear Cool Sport, and Sunnywood Jordan Farms Red Rice. Follow Polecats Manila online @polecatsmanila. Tickets are at Php 500 and available through students and teachers, at the event date, or at the Polecats Manila Studio, 22nd Floor, Strata 100, F. Ortigas Jr. Road (formerly Emerald ave.), Ortigas, Pasig City. For Tickets and Inquiries, you can email [email protected] or text +63917 – 700 7653.